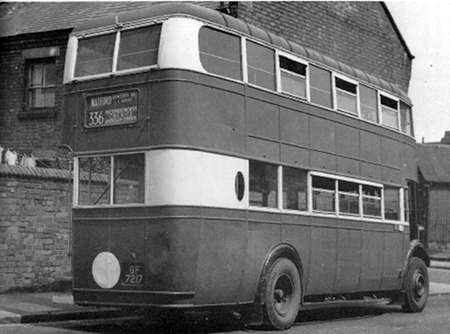 This vehicle was one of two early diesel-engined buses bought by Portsmouth Corporation in 1931, the other being a Crossley Condor. They were both bought as an experiment and compared with four Leyland Titan TD1, bizarrely, petrol-engined versions, because Leyland didn’t offer a diesel engine then! This ‘snouty’ AEC Regent, the Condor and two of the four TD1’s, were bodied by Short Bros. The body exudes a light, airy feel about the inside. Note the grills above the front downstairs window and the destination blind in the rear-most downstairs side window. Sadly, this unique vehicle in the fleet was destroyed by enemy action in 1941. The corporation, shortly after purchasing it, standardised on diesel-engined Leyland Titans and no more AEC buses were ever purchased. There are some intriguing aspects to this photo – firstly, there are two plates affixed to the radiator. One may well say Regent, would the other one say ‘diesel’? Secondly, it has a starting handle (for a diesel? ), and, thirdly, the upper structure still appears to be in undercoat, yet the lower deck is gloss painted and lined out! I’ve seen a few pictures of pre-war (and wartime) diesels with starting handles. I seem to remember Roly Wason, in his entertaining book "Busman’s View" mentions that in West Hartlepool they would put a rope on the handle so that relays of men could "flick over" a recalcitrant bus. A lovely photo of the classical era when buses were evolving. 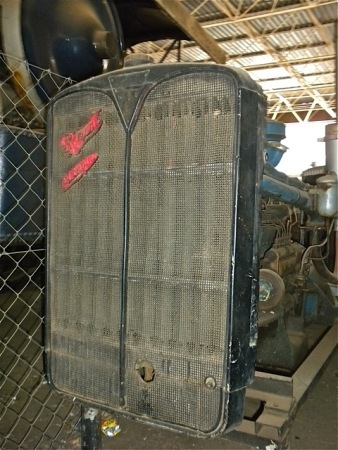 I believe the second plate on the AEC “Regent" radiator is “Oil Engine”. This plate was fitted to many AEC “Regents" with diesel engines in the period up to about 1935. Bradford Corporation “Regents” 396 to 419 of 1935 with 8.8 litre diesel engines had their radiators fitted with a second plate with “Oil Engine” inscribed. This attractive bus raises many questions, probably unanswerable, but here goes….. Portsmouth buses traditionally had the lining-out on the upper deck panels also. Was this only on later models, or could this have been a "rushed" official photo? In warm weather, it must have been quite hot on both decks with such limited ventilation. Were they modified later? Never having ridden in one, was there extra leg room on the front upper-deck seats under the "piano front" or was it panelled off purely for the destination box? Finally, the upper deck seats seem very high in relation to the height of the roof. It almost has the proportions of a lowbridge bus. Were they high-back seats or was it just a very high upper deck floor? …..and, of course, the legend "Leyland Diesel" adorned the bonnet side of PD2s and PD3s right up to the end – despite "Leyland Petrol" being a thing of deepest history! With regard to Portsmouth Corporation not buying any further AEC buses after the Regent 1 they did in fact buy a batch of Swifts in 1969 with Marshall B42D bodywork I believe they were numbered 175-188 but I am not certain of those numbers. Some Regent Vs also had a badge on the bonnet side which said AEC Diesel. Paul, although no more experienced in this era than you, two points. (1) In order to avoid patent problems with Leyland and their low-bridge design, AEC came up with the camel back – a hump all the way down the middle. (If this is one, the photo is washed out at the roof and wouldn’t show it.) (2) There was a period of full-drop windows. If this is one of those, it would not be self evident with the windows fully closed. Thx for confirming my ‘oil engine’ thoughts, Richard. To answer your thoughts as best I can, Paul, all buses were lined out, top and bottom, and this never changed, although it was simplified post-war. I’m inclined to think this is a ‘rushed’ official photo, although CPPTD often had their ‘tween decks adverts painted on for a long-term contract and might have been prepared to receive the bus like this for such an advert. 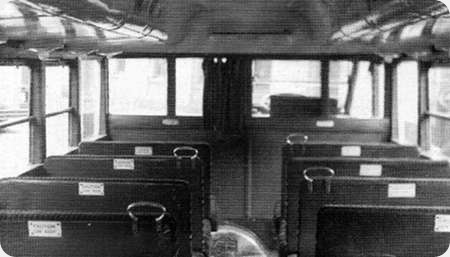 The ventilation might have been better than appears, for many buses, of the time, had one-piece sliding windows which came down about two-thirds of the way, worked by a car-type handle. I didn’t recall this type of seat back being any higher than was normal for slightly newer buses, so low window bottoms or a high floor must have been responsible. There was no need for lowbridge buses within its territory. The nameplates on the radiator say "Regent" and below "Oil Engine". This Portsmouth bus must have been an early recipient of the then very new 8.85 litre version of the AEC oil engine with the Ricardo Comet indirect injection system. This motor, which became successful and well known as the "8.8", appeared from mid 1931 in replacement of the indifferently reliable Acro head A155 engine, which had a capacity of 8.097 litres. The retention of a starting handle was quite common on early oil engined Regents. 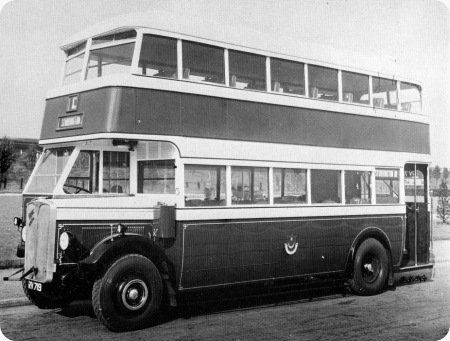 It is noteworthy that, at about the same time as it bought this solitary AEC, Portsmouth purchased an example of the Crossley Condor with the 9.12 litre direct injection engine, and this must have impressed the Corporation rather more than the Regent, since another 20 buses of this type were bought in 1932. The continued specification by Portsmouth of the Crossley direct injection engine was another interesting feature, as by then, the indirect injection VR6 version was much more widely favoured. In any event, contrary to the experience of operators elsewhere in the country, the Crossleys earned their keep, turning in an average fuel consumption of 9.5 mpg until they were withdrawn in 1947. Probably on the strength of this earlier experience, notwithstanding a subsequent very successful allegiance to the Leyland Titan, Portsmouth bought more Crossleys in 1948, but the DD42/5T type proved to be another creature entirely in the reliability stakes. I must acknowledge that the sources of my information above are the books "Blue Triangle" by Alan Townsin, and "Crossley" by Messrs Eyre, Heaps and Townsin. I should have mentioned in my first ‘blurb’ that the bus was blinded route ‘D’ and ‘Stubbington Avenue’. Thanks, David and Chris for your replies. Yes, Chris, if I tilt my screen I think I can just about make out a domed roof which would explain the upper-deck proportions. However, I’m still not convinced about it being highbridge. In 1931, Belfast Omnibus Co. bought a batch of Short Bros Regents which, to my untrained eye, look almost identical, but these were classed as lowbridge. 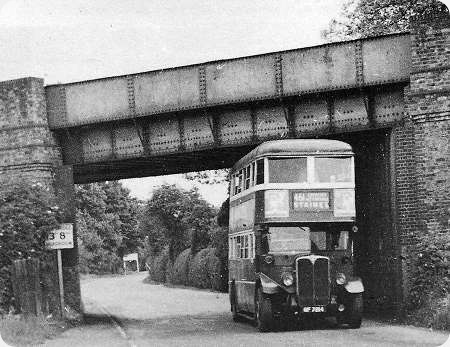 There is a photo of one on page 9 of "The British Bus Scene in the 1930’s" by David Kaye. Could the confusion (on my part) be to do with them being "low height" as opposed to having a lowbridge sunken-gangway seating layout? Thx, Roger, for that interesting info. I never realised that pre-war Crossley engines were direct injection and produced such good mpg figures. They should have updated it, rather than introduced the HOE one, which had such a poor reputation, after they stopped infringing Saurer’s patent. Incidentally, whilst most of them were withdrawn in 1948, the rest were withdrawn in ones and two’s, the last in 1951, at 20 years old. And CPPTD also bought some DD42/7’s after the 5’s above: what gluttons for punishment! Probably a distress purchase, such was post-war bus/coach demand. Many thanks Chris, for this superb posting! This was a fascinating and speedy era in bus development, and Portsmouth Corporation was a standard bearer in that department. They had batches of TD2s TSMs, and Crossley Condors, all with the same composite EEC bodies, so, from the rear, they would all look alike, and even the first TD4s had a similar 5 bay metal framed version. It was a truly fascinating fleet, to say nothing about the 6 wheeled Karriers of a mere year or two earlier. I think this Short bodied Regent is one of the first of the style which replaced the camel roof type, and was very common, mainly on AEC and Leyland chassis, all over the country. Obviously, PCT were not particularly impressed with the AEC "oil engine", or Regents in general, as future orders, post 1933, were Leyland dominated, and one wonders why the trolleybus fleet became AEC based. Perhaps something to do with a liking for EEC equipment offered by the AEC/EE partnership? Just imagine what it would have been like to be an enthusiast in Pompey in the 1930s, with such a fascinating bus fleet, and so many experimental trolleybuses too! Its the stuff that dreams are made of! I feel this must be an official view, taken I suspect by the bodybuilder, but why the upper deck painting was not complete is beyond me. This bus and all the other Short bodies bought by Portsmouth were highbridge, photos of all the others had the seat backs visible through the windows, they must therefore have had a high floor. This same characteristic is shown on Short bodied TD1 and TD2’s with Southdown. A summer photo of one of Portsmouth’s Short bodied TD1’s shows 3 upstairs windows each side open a good half way, so ventilation would have been fine. Finally Service C/D didn’t run to Stubbington Avenue, so I suspect the screen were set randomly for the official photo. Just to confirm Diesel Dave’s comment about post-war Portsmouth AEC’s. There were 12 saloons, all of them Swift 2MP2R chassis, and had Marshall B42D bodies. They were numbered 176-187 (NTP176-187H), entering service in Aug/Sep 1969. They followed two batches of Leyland Panther Cubs, 12 with Marshall bodies, and 14 with Metro-Cammell bodies (all B42D, new March to Oct 1967, Nos 150-175). I recall reading that the AEC Swift and Leyland Panther shared the same chassis frame design, as AEC was part of the Leyland group from 1962. But I don’t know what similarities there were between the smaller Panther Cub and the Swifts delivered to Portsmouth, apart from overall length – Portsmouth did not want maximum size 36-footers for it’s city routes. It’s generally acknowledged that the Panther Cub was not a great success, and Portsmouth began withdrawal in 1977 – a mere 10 years – the final ones going in 1981. The AEC Swifts went swiftly however (oops! – sorry!) – The MAP project in 1981 saw the fleet significantly reduced, and the remaining Panther Cubs plus the 12 Swifts, (and 14 Leyland Nationals, only 5 years old) were all withdrawn and sold. On a different note, the Portsmouth Regent No 35 with it’s Short Bros body could be theoretically compared with it’s Southdown equivalent. But Southdown’s version (also with Short Bros highbridge body of similar design) was petrol engined, and hired, not owned. It was their No 10, and was lettered on the sides for a route in Horsham. Thus it is very unlikely that the two were ever side by side at South Parade Pier! It is one of those fascinating details that Portsmouth had two AEC double-deckers pre-war, both were numbered 35, and both had comparatively short lives. Our featured Regent was destroyed in the air-raid of 10 March 1941, and only the engine was salvaged and sold to Nottingham Corporation. The previous 35 was an AEC "B"-type purchased in 1926 from LGOC via a dealer(new c.1913) with a Dodson body, along with ten other Dodson bodies, which were used on the original 10 Thornycroft Js. It didn’t last long, but in it’s short career it was re-registered from LF 9344 to BK 2342 (transferred from a service vehicle), and had it’s body replaced by one of the Wadham bodies from the original Thornycrofts, albeit cut down to a single-decker! It was withdrawn from PSV use in 1927, and was used as a petrol tender until 1930 – probably to keep the thirsty Karrier 6-wheelers going in service. Thank you, Michael, for the additional information, especially that of the first 35 and its interesting life. You mention the air raid of 10th March 1941 (with the loss of quite a few vehicles, including two Crossley Condors) but I’ve never seen mention of which depot it was. I assume from the loss of buses, not trolleybuses, that it was North End and not Eastney. Thanks Chris for your kind comments. All the books and notes I have state that it was Eastney depot which was badly damaged on 10th March 1941, destroying ten buses, and damaging others. Both trolleybuses and motorbuses were kept at North End and Eastney depots. My source says that the incendiary bombs hit the bus garage and workshops. There was also damage across the city, and several major trolleybus routes had to be curtailed until wiring and road repairs were completed. There was bomb damage at North End depot, too (date not given), but this was restricted to store rooms, no vehicles apparently involved. But no trolleybuses received major war damage at either Eastney, North End, or on the streets. Last year I visited the Transport Museum in Johannesburg a took a photo of an AEC Regent radiator mounted on a sub-frame with a 8.8 litre engine circa 1935. The stored exhibit had lost its the AEC triangle badge but does have "Regent" and "Oil Engine" plates on the radiator wire mesh as well as the spline for a starter handle. I would have posted this photo sooner but made the previous entry when on holiday. Chris, please keep posting these lovely pre-war photos of Portsmouth Corporation. Well, Richard, what an unusual find and way to prove a point! As for other ‘Pompey’ photos, I’ve a couple more up my sleeve. The quick and sad end of CPPTD, I try to keep at the back of my mind! Two of these impressive and handsome vehicles (51 & 52) were purchased in 1934 for the Eastbourne to Beachy Head tourist service. The local authority would only allow the service to operate with single-deckers, so Southdown decided to buy the largest single-deckers available at the time, which, by law, had to be 30 foot long six-wheelers. Long-time Leyland adherents, they settled on the fairly rare TS6T (T standing for Trailing Axle), which enabled them to carry 40 passengers on the profitable route. A further two (53 & 54) were bought in 1935, this time TS7T’s. Originally fitted with Leyland 8.6 petrol engines, they were all fitted with 8.6 diesel engines in 1940. Despite their luxurious appearance, they were considered to be buses by Southdown, bearing the name in letters rather than ‘real writing’! After their hard lives, they were all withdrawn from service in 1952. The photo shows 551, in about 1950, about to depart from Eastbourne Pier and grind its way up to the top of Beachy Head. Note the driver in his summer uniform. What truly magnificent vehicles, and even further enhanced by the cream side destination boards. My own experience of the ascent on service 97 to Beachy Head is confined to the delightful open top Guy Arabs in the 1960s – and there’s scarcely any need to go into detail about the delightful acoustics of that journey !! Yes, the austerity Guy Arab II’s were converted to open-top around 1950-51 and some re-engined with 6LW engines for the Devil’s Dyke/Beachy Head services. The service became 197 around that time, too. The open-toppers were used all along the South Coast, even a couple on Hayling Island. They lasted until about 1964. Unlike the TS6T’s, the basic Guys were regarded as coaches and given ‘Southdown’ side panels in ‘real writing’! A 1964 film, The Chalk Garden, has Hayley Mills and Deborah Kerr boarding one of them, with it pulling away. I don’t know how extensive the rebuilding of the bodies was, but they always looked impeccable, right to the end. Southdown were a class act. So true Chris H, Southdown were exactly as you say – "a class act." The winning combination of high quality handsome vehicles and impeccable maintenance was perfected even further by perhaps the most dignified of all liveries in such very pleasing colours. and what about the Harrington Cavalier coaches with only 28 seats for there road cruises. By the late 1960s, the Devil’s Dyke service was operated with convertible ‘Queen Mary’ Leylands. At Southdown, vehicle allocation, (including when the tops were to be removed), was decided by the Engineering Department rather than the Traffic Department, unlike other companies I knew, a practice that didn’t always contribute to efficient traffic management. Their policy on which style of company name to apply to any particular vehicle or type, was inconsistent. I am well aware of Southdown’s reputation amongst some enthusiasts, and I have no desire either to offend anyone or spoil their image of the company. Certainly Southdown itself thought it was a ‘class act’, a view it didn’t hide from its BET neighbours. However, at the risk of being thought sour, I remain to be convinced that Southdown was anything out of the ordinary. From an enthusiast’s point of view, its fleet was less interesting and in some ways less operationally imaginative than, for example, neighbour M&D’s fleet. For instance, I always thought M&D’s AEC Reliance coaches with ZF 6-speed gearboxes were decidedly better for both drivers and passengers than Southdown’s Leyland Leopards with Eaton 2-speed axles. The standard of maintenance and turnout was high, granted, but the same could be said of pretty well all major operators; their livery was attractive, (even though the capital letter version of the name was distinctly old-fashioned), but, again, the same could be said of many other operators. By coincidence, this posting follows one of Richard Fieldhouse’s lovely postings: – a West Yorkshire K6B. Having been involved at close quarters with the management of both companies, I have little doubt about which of them was operationally the ‘class act’. From a management viewpoint, West Yorkshire would win hands down every time. Sorry if I have upset anyone. I don’t have any professional reason to hide my identity but, in confidence, I can pass on similar comments from friends in the industry. The professional perspective and that of the enthusiast often differ and I have spent hours with professional friends explaining cogently why certain things had to happen which leave enthusiasts in a spin – including the splitting up of that sacred cow, London Transport. You know, you should never speak ill of the dead! I was born and lived in Southdown territory for over 50 years and drove for them for almost 22 years at their Eastbourne depot from 1969 so worked quite a few trips to Beachy Head but I regret only with the convertible PD3’s, except for a couple of "memorable" trips with a Bristol LD6B borrowed from BH&D for a summer season. The lack of performance was embarrassing so much so that drivers on the local private coach companies complained to the management of their sluggish efforts to climb the steep twisty road up out of Eastbourne. The company was definitely a "class act", although conservative in it’s choices the vehicles were always solid reliable and very comfortable with well upholstered higher backed seats in an attractive patterned moquette, the same standards were maintained until the end of the PD3 deliveries after that they got pretty much what they were told as did all NBC companies. We felt at Eastbourne that our standards of maintenance and cleaning were higher than any other depot a view borne out when we drove vehicles from other depots (yes we were snobs) but of course all this went downhill as NBC increased it’s stranglehold on the company and things sunk to a low level, a brief respite when it was privatised (so it was a basket case) then came Stagecoach about whom I would rather say nothing. What followed was an extremely sad and messy end to a very proud and respected company but in it’s prime a true CLASS ACT by any ones definition. To be fair, Dave, it may not be (traditional) Southdown but, by all modern standards, Stagecoach IS a class act. It’s just not enthusiasts’ heaven – no one makes vehicles today that are interesting enough! Very belatedly, I’ve just seen A Non’s comments above, which, by chance refer to the three companies I knew well in the 1960’s: Southdown, Maidstone & District and West Yorkshire. I was both surprised and gratified to see that views I’ve always had, but have often kept to myself for fear of offending others, are shared by at least one other person. I think he’s spot on. First, I agree wholeheartedly that M&D’s AEC Reliances, with their 6-speed ZF gearboxes, were decidedly superior to Southdown’s Eaton 2-speed axle Leyland Leopards, both to drive and from a passenger standpoint. A Non is absolutely right, in my view, and I was glad to see David Oldfield’s endorsement of his comments. A Non is also correct, I believe, in describing M&D’s fleet policy as being more imaginative than Southdown’s. M&D didn’t always get it right, (as their sad experience with the Albion Nimbus and the early Atlanteans demonstrates), but they displayed a greater concern for their passengers and staff than their conservative southern neighbours. I agree with him, too, in his assessment of the management and management style of Southdown. They certainly made no secret, to their BET neighbours at least, of their own superior opinion of themselves. M&D and Southdown operated a number of long joint services with each other – to the point, unusually, of each company’s staff operating the other’s vehicles – but the relationship between the two managements was not especially close or particularly friendly. M&D’s Traffic Department co-operated more closely with East Kent, and both regarded Southdown as stand-offish. M&D was a pleasant company whose staff enjoyed intimate working relationships; Southdown was not. A Non’s right about the influence of the Engineering Department at Southdown over matters that at other companies were regarded as Traffic Department issues; that policy caused unnecessary operational problems and costs, and made for relations between Traffic and Engineering that were often strained and always distant, as I know from personal experience. Finally, A Non is totally correct in his judgment that West Yorkshire were a better managed company than Southdown. Southdown had a clumsy and inefficient management structure that may have flattered its own perceived superiority, but it cost more money than it was worth, it made decision-making difficult, and it had seriously demotivating consequences. In their own way, the Traffic Department at West Yorkshire had a high opinion of itself as Southdown’s did, but with one major difference: they were justified in their opinion. As a number of correspondents have pointed out, enthusiasts’ recollections of those days are sometimes coloured by memories of nicely turned out vehicles in smart liveries, perhaps ones they didn’t often come across and which therefore have extra nostalgic value. The managerial realities of the companies involved, however, does not always correspond with those recollections. I’m very sorry if I have offended any Southdown fans, but A Non raised important and valid points that were worth making even if they are often left unsaid. I’m assuming, David O, that your comparison is with the other big groups and am genuinely interested in learning in what respects it outshines the others. You’re right about the lack of ‘interesting vehicles around today, although ‘bottom fishing’ around the small independents sometimes produces the odd gem! Sorry, David. I totally disagree about Stagecoach. I have worked for this operator in the past, and now have to put up with a very poor and unreliable bus service through my village to the neighbouring towns. The Stagecoach maintenance budget is greatly over constrained, with buses suffering from extended silly faults that could be easily fixed with suitable finance. The basic obligation of a bus operator is to run the service(s) safely and reliably with clean, inviting vehicles. This is impossible if maintenance standards do not measure up. Deregulation gives bus operators carte blanche to run what they like and charge well above a reasonable margin in fares. Stagecoach has just handed out £340m to shareholders with Brian Souter and Ann Gloag personally getting £88m between them. A bit more on maintenance would be more appropriate. The present structure of our public road and rail transport industries is a disgrace. I am but a humble professional musician/music teacher with a PSV who has spent many (many) years driving buses and coaches (and preserved vehicles) on a part time basis. I am never "opinionated" because all my comments are considered and based on fact and verifiable material. Different managers, companies and sheds may occasionally fall short of the mark; politicians may ensure that expensive initiatives funnel investment into city areas and away from the rural population but Stagecoach has been vilified, often unjustifiably, for being Stagecoach. [I am talking about the mature company, not the young "pirate". I am talking about the experience of industry professionals and real passengers alike.] You may not like them – that is your prerogative – but that is not my point. Only Stagecoach and Go-Ahead consistently win awards and plaudits from within and without the industry. It is on material like this – gleaned easily from publications like Route One and Bus and Coach Buyer – that I base my comments. …..so yes, Chris, I am comparing with other groups. And, Roger, it doesn’t mean that I don’t agree with you substantively and everything else. …..oh and, I don’t – and never have – had shares in Stagecoach or any other company. A number of interesting comments in this thread about the superiority or otherwise of certain operators but I will just confine myself to pointing out that if you go today to the exact spot where that photo was taken, you will find that the view is unchanged sixty years later (including the lamp post in the background) and that you may still board a bus there for Beachy Head although it may well be a Scania double decker of Brighton & Hove. A visit to Eastbourne is recommended for the annual running day in August which usually includes journeys to the top of Beachy Head in a PD3, a journey I first made some 45 years ago (and have the tickets to prove it). In the area I live in, First Group operate the majority of services, with a few contributed by Stagecoach. These days, I much prefer to travel on a Stagecoach vehicle – their service locally seems generally more efficient, and cleaner. I could almost be attracted to modern buses! That is not say that First are inefficient or grubby, but they are not in the same ball park as Stagecoach in this neck of the woods. In general, the First Group local stock consists of some quite elderly vehicles too, which doesn’t necessarily help the image – but would the man in the street or on the seat notice this? Like some others here, I have no shares in any bus company and have never been employed in the bus industry – just an observer and passenger for many years, and this is just a personal view. Others can disagree, and we will enjoy reading the other comments in due course. Thx, David, for quoting the source of your knowledge about Stagecoach (and Go-Ahead). Roy, it’s not whether ‘fans’ are offended by ‘insider’ comments – I think most of us contributing on this site are old enough to appreciate and welcome measured and informed opinion, rather than be influenced by one livery over another or the smartness of staff uniforms! I, for one, find these discussions useful and I’m sure I’m not alone. One point: for many years, Southdown had a fare-sharing arrangement with Portsmouth Corporation, which involved route-balancing swapping of buses (but not crews) at the year-end, usually with Portsmouth buses on Southdown routes, but I recall one year where the reverse happened. Do you know what the relationship was like between these two organisations?. A very interesting observation, Nigel, on the unchanged scene after 60 years. almost unheard of in this day and age! And thanks for the heads-up on the annual running day. Where would the actual date be published? Interesting observation, Chris H. Anyone who’s ever read any of your comments on this site will recognise both your own extensive knowledge of the industry and your commitment to remembering and understanding it in an informed, realistic and unbiased way. On the other hand, there are lots of comments, (you can see some on this page alone), that rate an operator on the basis of well turned out vehicles. Maybe I’m just sour, but I do rather disagree with the often expressed view – it’s clearly your view, and I have no wish to upset you – that Southdown were a ‘class act’. Operationally, they were often inefficient in many regards, certainly in comparison with West Yorkshire. The company seemed to encourage compartmentalisation, which in turn discouraged contact and co-operation both internally and with other operators. I found this to be in stark and unhelpful contrast with everything I had seen at WY and had been taught at Maidstone & District. I can’t, I’m afraid, throw any light on your question, Chris, about the arrangements at Portsmouth between Southdown and Portsmouth Corporation, since I was based in Brighton. However, illustrative of the point I’m trying to make is that in the year and more that I was there, I never met my ‘oppos’ at Portsmouth – my request to do so being summarily dismissed as unnecessary – and I recall speaking to them by telephone only once. Similarly, although we were of course heavily involved in the Brighton Pool with Brighton Corporation and Brighton, Hove & District, those operators were regarded more as competitors for staff than as partners. No need was seen for contact between us at an operational level, (the idea was variously described to me as ‘dangerous’ and ‘pointless’), and there was none. This site is not the place for gripes, however, and I repeat my apologies for attacking a reputation that many fans hold dear. I just don’t share their view. I have a high opinion of the operational efficiency of West Yorkshire, and I have the fondest possible regard for Maidstone & District, ramshackle and bumbling though they occasionally were. Both were, in my experience, better, (and definitely happier), operators than Southdown. But apologies are not required, Roy. We speak as we find and, as some of us have already intimated, the professional and insider view can be at variance – sometimes wildly – with that of the enthusiast. My conversations with "professional" friends constantly bear this out. I simply have to agree with Roy`s comments on the general points of difference between the likes of "West Yorkshire" and "Southdown"! The former Tilling group`s whole ethos was based on rugged efficiency with a truly Northern "no nonsense" approach, whereas the more noted BET operators always seemed to have the politicians ideal of putting on a "frontal image". Certainly, in the Bradford area, I do not recall any adverse comments about West Yorkshire, it being an organisation which always commanded public respect. Unlike YWD, or Hebble, its vehicles were always well turned out, and the whole operation exuded total efficiency! Other members of the group always gave me the same impression, United coming to mind. I know I am only an enthusiast, and not an "insider", but I was well tuned in to public awareness, and this feeling was, I am convinced, well founded. It is a great pity that this superb bus operator is no longer with us, as, like so many of our industrial organisations of the past, we did not know what we had until we lost it! As for the present day, I have no interest whatsoever, and suggest we stick to the 1970 (or earlier?) limit for this website! Well my comments certainly provoked a varied response from several of my fellow contributors to the site which I suppose is one of it’s aims. 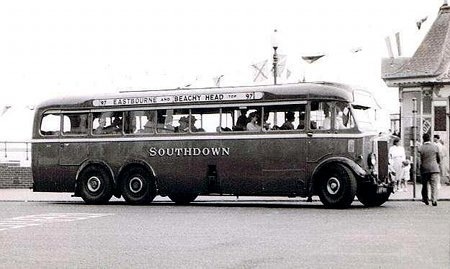 I have to admit my admiration for Southdown came about during my childhood from the early forties so has no basis in administration or engineering just my personal experience of being a passenger and enjoying that. I did drive some of M&D’s Reliances and Panthers on the Heathfield cycle routes and enjoyed the experience very much, if I am honest I must admit that I found the Reliance a far better vehicle to drive whether in bus or 6 speed coach form. If you took the time to master it the Leopard with 2 speed axle was a pleasant vehicle to drive but the engine never pulled as willingly as the AEC motor and the controls were much heavier. So you see my admiration for Southdown is purely a childhood fantasy and I will be forever prejudiced, thank you for indulging me. This years event is on Sunday July 22nd and already promised are a Leyland Lion, AEC Regent III, Regent V and Leyland PD2 ex Eastbourne Corporation, a Guy Arab and Leyland PD3 ex Southdown and an AEC Reliance ex East Kent. I spent my holidays on the South Coast in the 1960s and 1970s riding on buses like these, well perhaps not the Leyland Lion! As a former West Yorkshire engine fitter from 1969 to 1987, it is heart warming to read comments about the company being a ‘class act’. From an employee’s viewpoint WY was a good company to work for, with generally good facilities and working conditions. Certainly the atmosphere at the Central Works, Body Shop and Head Office complex in Harrogate was that of one big family – with all that that entailed! Despite the loss of our attractive ‘Tilling’ bus and coach liveries under the aegis of the NBC, and the relentless governmental drive towards one-person operation (whether it was needed or not), WY remained a well-run and generally well-respected organisation. Brian Horner was general manager for much of the NBC period, and in many peoples view built on the standards inherited from his predecessor Jack Lawrence. The bus and coach fleet were generally well-presented for what was a fairly large concern, and the tours and holidays side expanded under the steady hand of the late Gordon Dingle. The company had a policy of continued modernisation of its depots, offices and other facilities, and in the 1980’s WY devised a preventive maintenance programme to further improve vehicle reliability, based on its own data relating to component life. West Yorkshire was indeed a ‘class act’ and is sadly missed by many including me. I still have a soft spot for Southdown though…….. The Southdown engineering department had a penchant for cutting down the engine output of their Leylands and Guys, ostensibly in the interests of fuel economy, and road performance suffered. I recall particularly a ride in the early 1960s on one of the very fine Park Royal bodied Guy Arab IVs on route 23 between Crawley and Brighton, a service that encountered some pretty stiff gradients across the Weald and over the South Downs. The governor of the bus’s 6LW had been reset to such a low level that the engine died back at a road speed of about 25 mph. I always felt, also, that Southdown Leylands decidedly lacked sparkle on the road. I worked twice as a PSV conductor for Southdown Portsmouth depots in the 1960s as a student holiday job and had the fortune to work on PD3s of the time. As for the comment for nowhere for the conductor to stand, it was the custom for them to stand at the front at the base of the staircase and lean through an open window area over the left hand side of the front mounted engine to keep the driver company (obviously when safe to do so). The driver’s job was not so lonely and isolated as it is now on the ‘one-man bands’ that we have all become used to! Some drivers hated the PD3s especially the so-called’one-leggers’ which had a gearing system at the top of a long metal column that was mounted on the floor. I must admit that I considered the introduction of the ‘Queen Marys’ in 1957, when I was still attending school, unusual in the light that most bus companies were looking towards the introduction of Leyland Atlanteans in their fleets. Many PD3s came up to Leicester, where I now live, having being purchased by ‘Confidence’ for use for transporting the then British Shoe Corporation employees. I used to be a frequent traveller on Southdown route 12 (Brighton/Seaford/Eastbourne) in the late ‘forties and early ‘fifties. But this is about route 126 that went over Hindover Hill. I was assured in my youth that the name "High and Over" was a form of "Hindover" that was invented by the Southdown company in the ‘thirties. Just another comment about Route 126. It ran from Eastbourne to Seaford, via Polegate and Alfriston. I used to use it as a local holiday treat when resident as a kid in Eastbourne during the late 1940s, early 1950s. My real memories of it were grinding up the long hill of ‘High and Over’ just before entering Seaford on the last lap of the journey, but another memory is that I think there must have been a vehicle size restriction on this service because I do remember how tight the parking was for the bus stop outside the famous old pub in the centre of Alfriston. Also, as an aside, does anyone else remember Drusilla’s on this route – a well known tourist destination on this route for its zoo and miniature railway?